Take oil in a kadai , add cumin seeds, mustard seeds and pinch of hing. Add the sliced potato, garam masala, salt and red chili powder. Cook it on a low flame till done. Now take a roti and apply tomato ketchup. Sprinkle little chat masala on ketchup, put small cut onions and finely chopped green chili on that. Now put the potato mixture which you have prepared, sprinkle some lemon juice, chat masala and cheese. 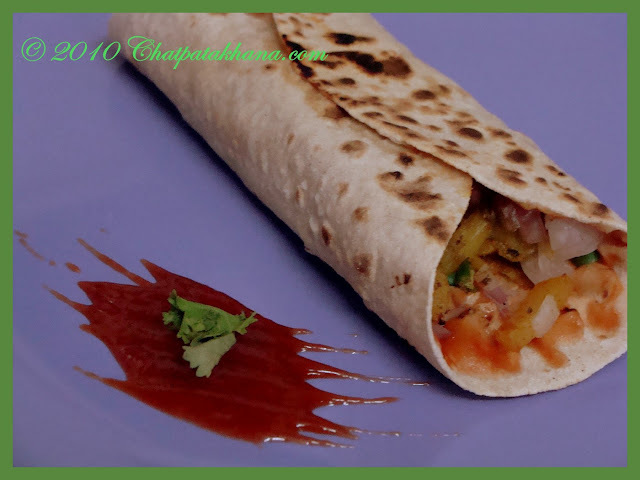 You can add a bit of green chutney in the roll also.